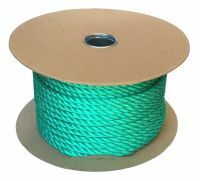 Please use this option to add a soft splice, loop splice or eye splice into your natural or synthetic 3 strand rope with diameters 6mm to 12mm. A soft splice is achieved by looping the rope back on itself and then interweaving the rope to make a secure join. This is the strongest way of introducing an eye into a rope and enables easy hanging to garden posts or suspending from a branch in a tree. Please use the quantity box below to enter the number of soft splices you would like.